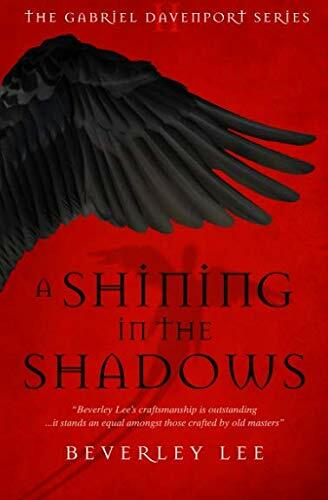 A Shining in the Shadows is the second installment of The Gabriel Davenport Series by Beverley Lee. The story picks up a year after tragedy struck The Manor House and the mortals who resided there. Gabriel has entered his new life as a vampire with his maker, Clove, and his two clan brothers, the moody Moth and the gentle bibliophile, Teal. When Clove receives information via The Bloodvyne—the mental web of linked vampire consciousness—of a cleansing to rid the vampire world of those with impure blood, he sets off with his vampire family to a small seaside village intent on gaining information from one of his peers, Emron D’Grey. Concurrently, two surviving members of The Manor House arrive at the same seaside village to attend a funeral. When their paths unexpectedly cross with Clove and D’Grey, and a young boy whom they thought to be dead, their weekend away takes a dark turn. Meanwhile, Emron D’Grey confirms Clove’s fear that the ruling body is indeed searching for vampires who carry a mutant gene; however, what neither Clove nor D’Grey sense is the true identity of the leader of the ruling body. Clove fears for the safety of his young brood (Moth, Gabriel, and Teal), as he knows one carries a secret, and he will do his utmost to protect him. But when D’Grey holds Clove captive it is up to the three young vampire fledglings to work together if they are to survive. Reverend Noah Isaacs is a man torn between his devout past and his ever-changing future. His love of God is replaced with the unexpected love of one much younger than himself. Lee weaves Isaacs in and out of the story with perfect rhythm, reining him in when needed to give the main characters their space to shine. But don’t be fooled, Isaacs is the underlying link that pulls the fragile relationships of the mortal and immortal characters together. While Lee wrote the first novel in this series using third person point of view (POV), the first two chapters of A Shining in the Shadows introduces the protagonist, Gabriel, using first person POV. Perhaps this creative choice was to allow Gabriel to speak in his new voice as a vampire, a rebirthing of a character, so to speak. This is an ambitious change to introduce to readers, and at times was a little jarring, particularly mid chapter via scene breaks. Lee’s descriptive prose using third person POV is strong and haunting. This attribute is particularly evident with the character, Teal. In chapter 25 the reader glimpses the inner workings of the esoteric mind of this young vampire. His voice is delivered with sweet emotive nuances that capture his ethereal demeanor. “Teal knew right there, in that moment, as the breeze brought the tang of the sea to his senses. He knew what the mutations were.” Teal, while seemingly a delicate creature, is a strong character, the stabilizing element that secures his somewhat dysfunctional vampire family. The Gabriel Davenport Series is best read in order: The Making of Gabriel Davenport, followed by A Shining in the Shadows.